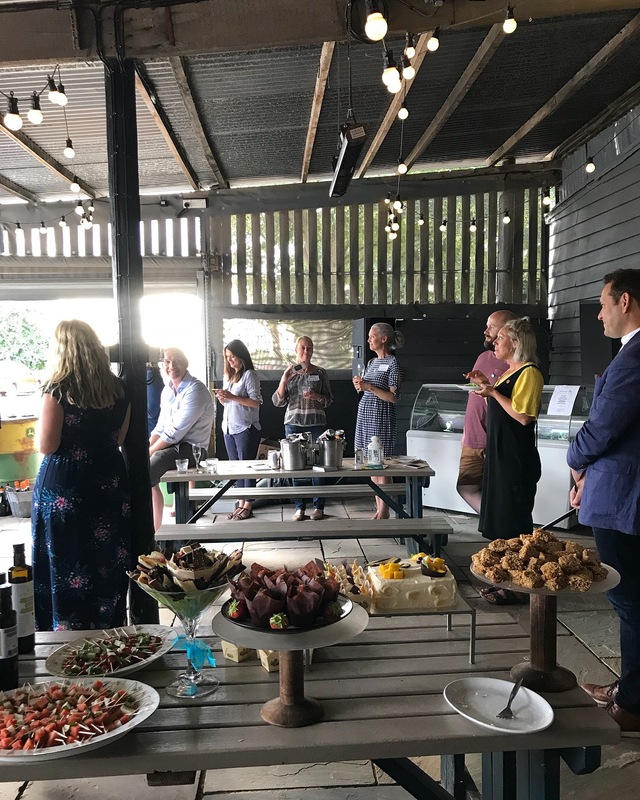 A cook book launch wouldn’t be complete without food and drink and the attendees certainly delivered. 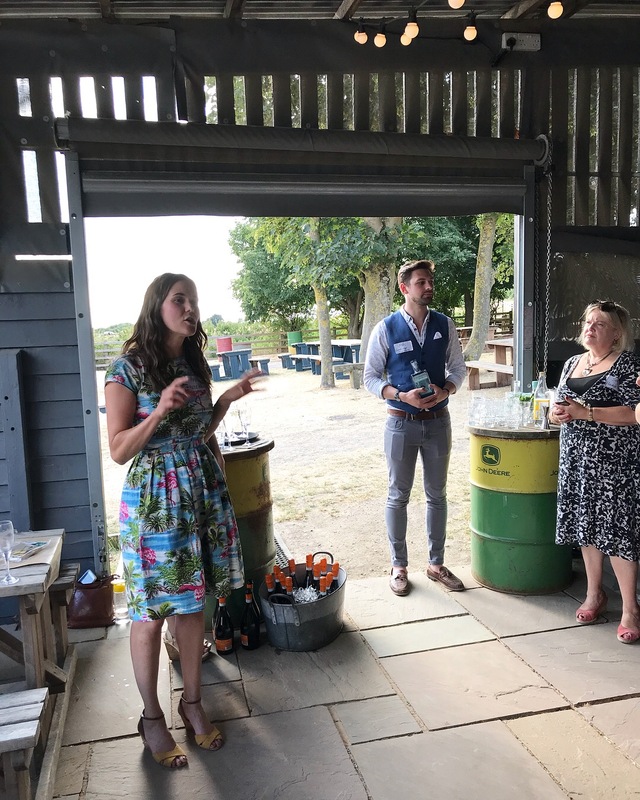 A welcoming Gin & Tonic, courtesy of The Cambridge Distillery, got things off to a good start. 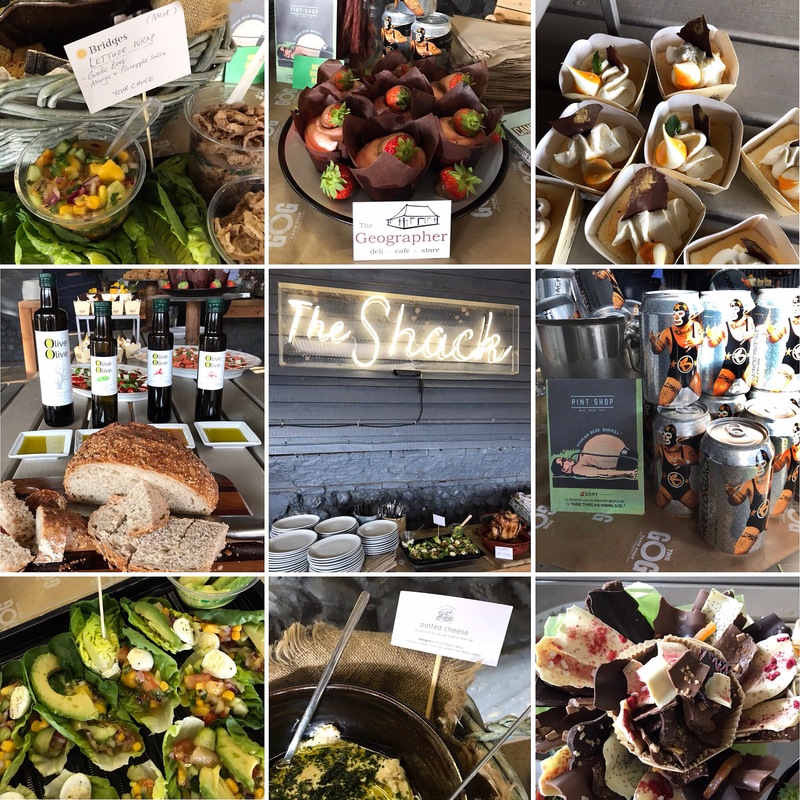 There were tantalising dishes and treats from The Gog (sausage rolls), Pint Shop (beer sticks and BrewBoard’s Hüellonbach oatmeal pale ale), White Cottage Bakery (potted cheese), Bridges (lettuce wraps), OliveOlive (halloumi and olive oil), Country Kitchen (flapjacks), Chocolat Chocolat (chocolate bouquet), Balkan Pottery (chicken made in their fantastic chicken cooker), The Geographer (cupcakes) and The Baking Jin (mango cake and cupcakes), just to name a few. 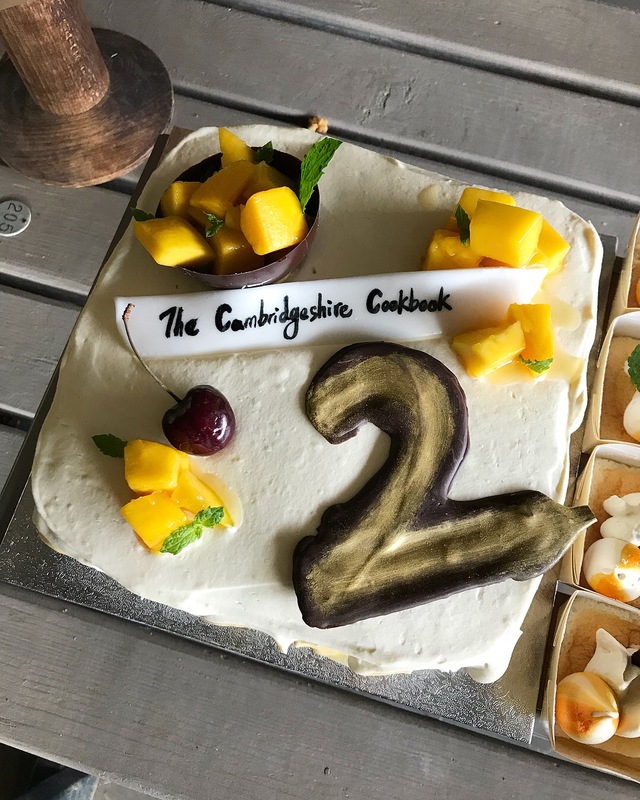 Jin Yee Chung (The Baking Jin) once again provided the book’s “birthday cake” – a delicious mango cake decorated with the number 2 to commemorate the second edition. 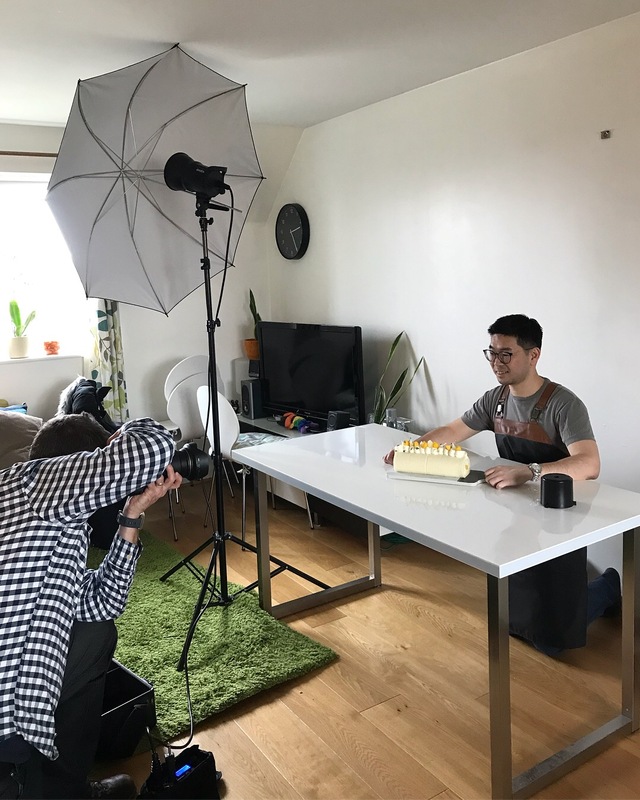 I met Jin at the launch of the first cook book, when he was included as the winner of the 2015 Cambridge Bake Off (his winning DNA cake still gets talked about). I was blown away by the flavours and textures of his cakes. That light and airy chiffon! I just had to let everyone know about this deliciousness. Since then Jin founded his part time cake-making business (he’s a software engineer by day) – and so The Baking Jin was born. Jin has been going from strength to strength with a growing list of customers and cafés supplying his cakes. He is even hosting his very first pop up – East Meets West, a sweet and savoury journey of fusion dishes and bakes from his native Malaysia and beyond. 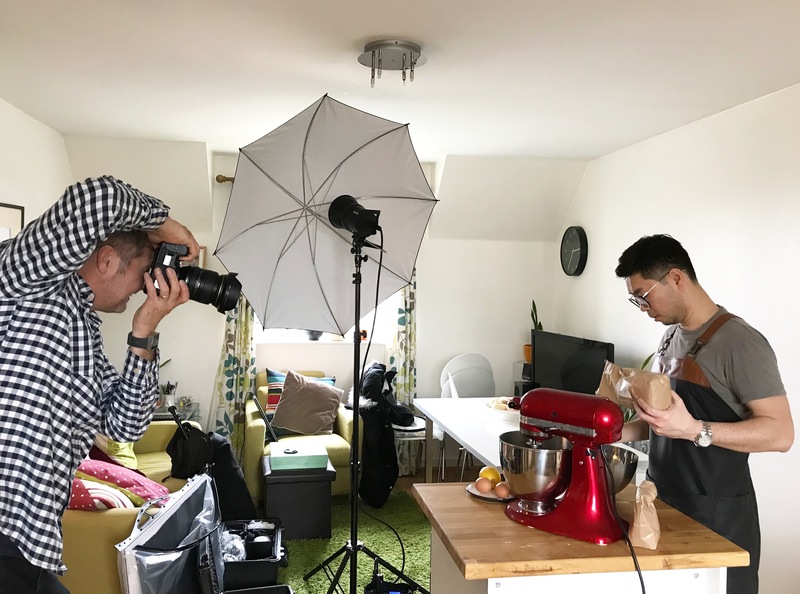 A few months ago, Jin asked me to assist and report “behind the scenes” at the photo shoot for The Cambridgeshire Cook Book: Second Helpings. It was a lot of fun but so difficult to keep his amazing cake a secret. All can now be revealed! 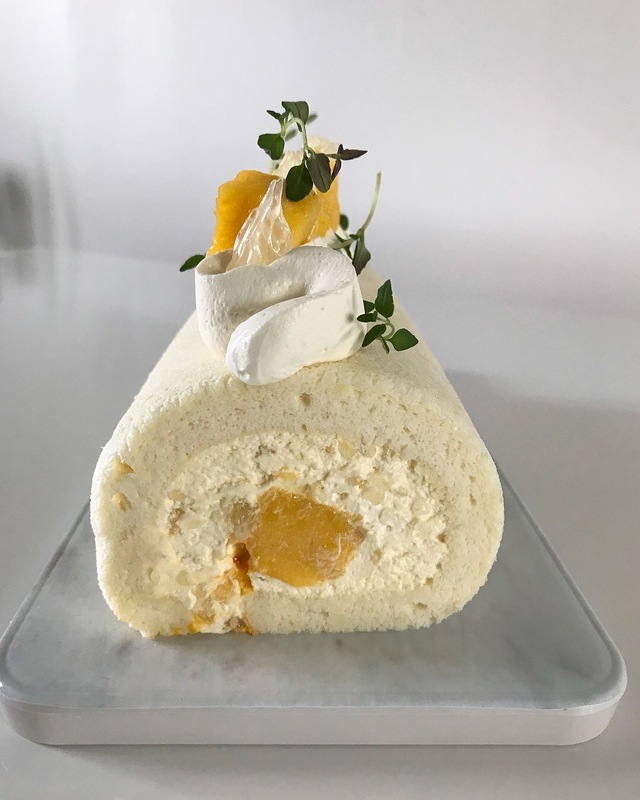 Jin’s take on the Far East’s mango pomelo sago classic dessert is truly stunning – a cake roll with a very light sponge. A genius recipe that he’s chosen to share in the cook book. As if leftover cake wasn’t enough of a thank you for helping out, Jin kindly offered me a copy of the cook book which I have decided to give away to one of my readers. The winner will receive one copy of The Cambridgeshire Cook Book: Second Helpings, signed by Jin. To enter, simply check out The Baking Jin’s website then leave a comment below (on this blog post) telling me which cake(s) caught your eye. The email address provided to leave a comment will not be visible to others and will remain private. The deadline for entries is 10am (GMT) Sunday, 29 July 2018. I will contact the winner via email at which time their UK mailing address will be requested. – You must be a UK resident aged 18 or over to enter. 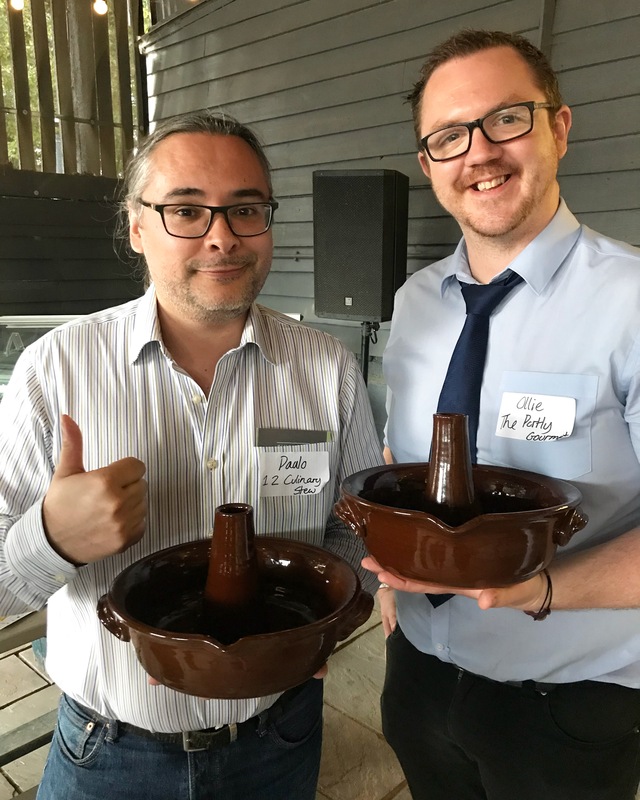 – The prize includes free delivery within the UK. – The prize cannot be redeemed for a cash value. – This giveaway is in no way sponsored, endorsed or administered by, or associated with Meze Publishing. 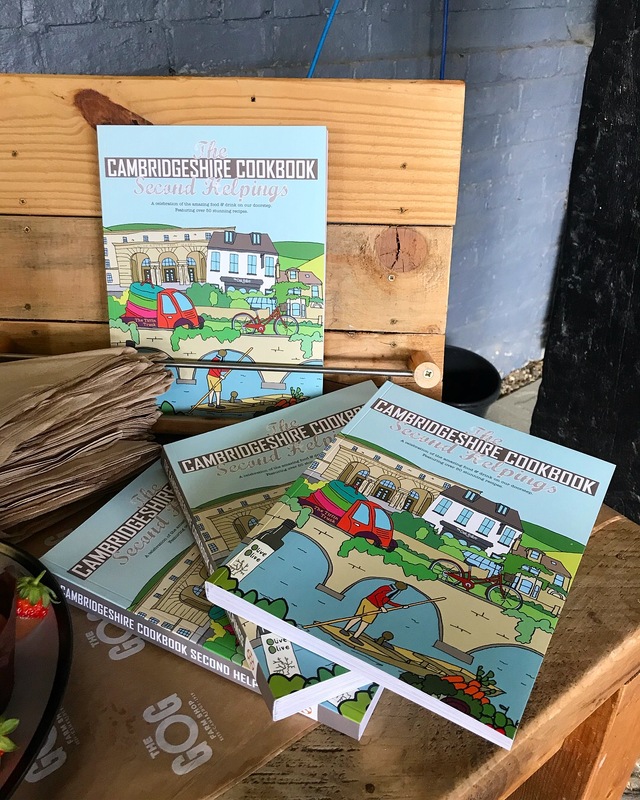 The Cambridgeshire Cook Book: Second Helpings retails at just £14.95 and is available from all the businesses featured in the book, listed here. It is also available online through the big corporations, which shall remain nameless. In the spirit of the cook book to support local independents, I suggest you order from the businesses directly. I’m sure they will appreciate it! 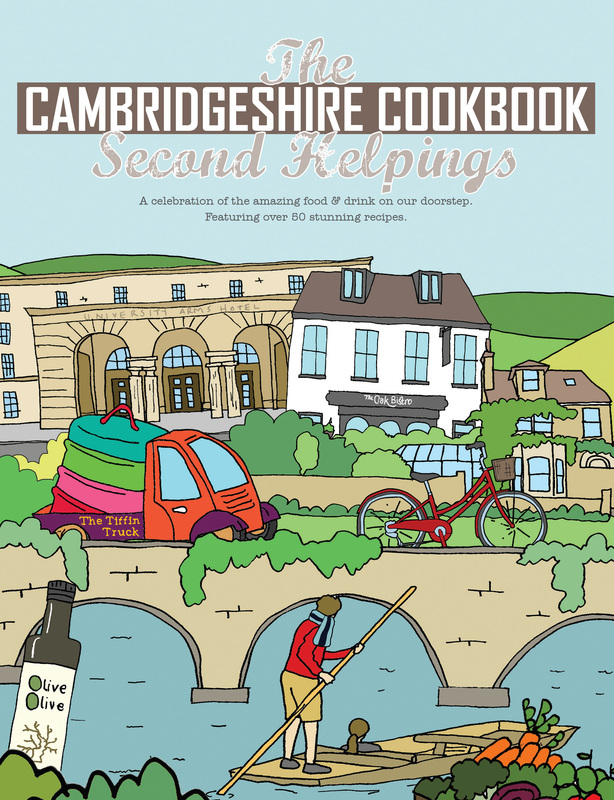 I was invited to attend the launch of The Cambridgeshire Cook Book: Second Helpings and received a complimentary copy. I did not receive compensation for my review. All views are my own. 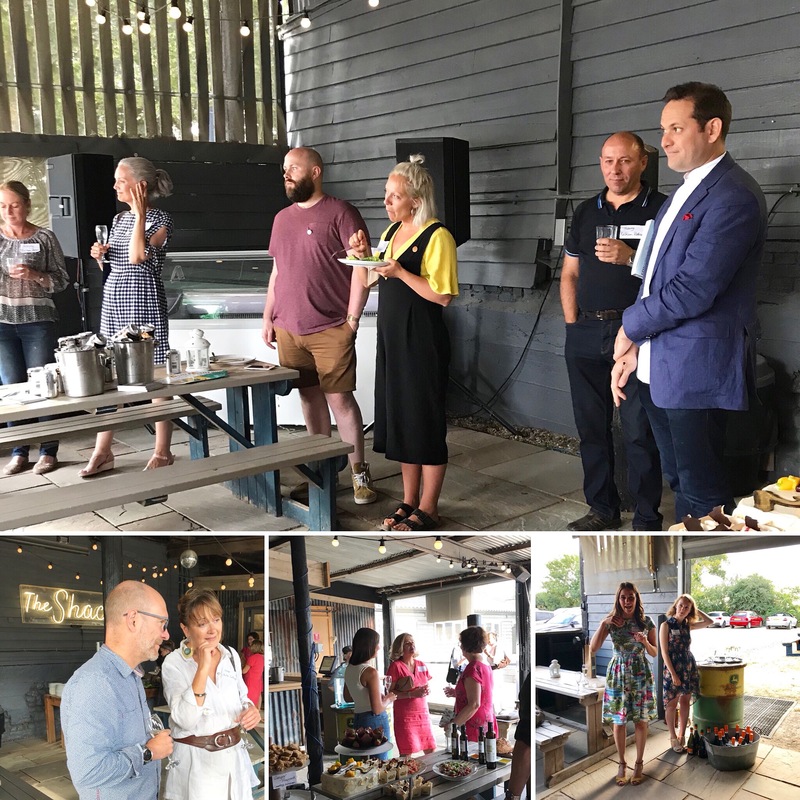 This entry was posted in Food Events and tagged Balkan Pottery, Bridges, Cambridge, Cambridge Gin, Cambridgeshire, chicken cooker, Chocolat Chocolat, Meze Publishing, OliveOlive, Pint Shop, The Baking Jin, The Cambridge Distillery, The Cambridgeshire Cook Book, The Cambridgeshire Cook Book: Second Helpings, The Geographer, The Gog, White Cottage Bakery by One Two Culinary Stew. Bookmark the permalink. The WhatsApp themed cake is so cool! I love the Halloween pumpkin and chocolate Victoria sponge. Marshmallows with eyes – eeek!! Thank you Joann! Children loved it :)! Thank you Emily, That Swiss roll is very popular in hot weather! I loved the first book and Jin’s pandan layer cake is one of my favourite ever bakes. I made it the first time I went to a clandestine cake club meeting to great acclaim. The colour alone made it a show stopper. The mango pomelo sago dessert looks equally stunning. Thank you Gina! So pleased you took the time to create that Pandan Layer Cake! 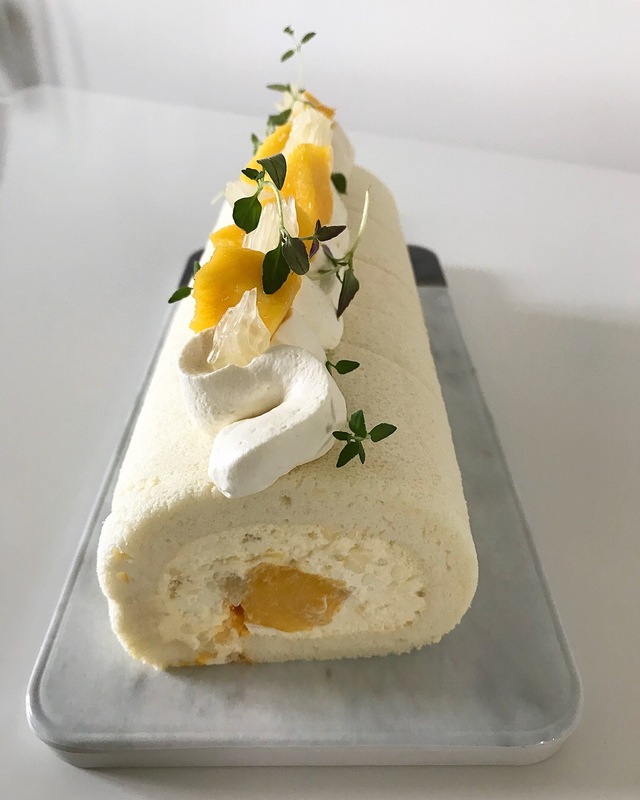 I should have added the mango mousse cake on the website looks fabulous! If my memory is right, that mango mousse cake was for Meggy (Bridges cafe). 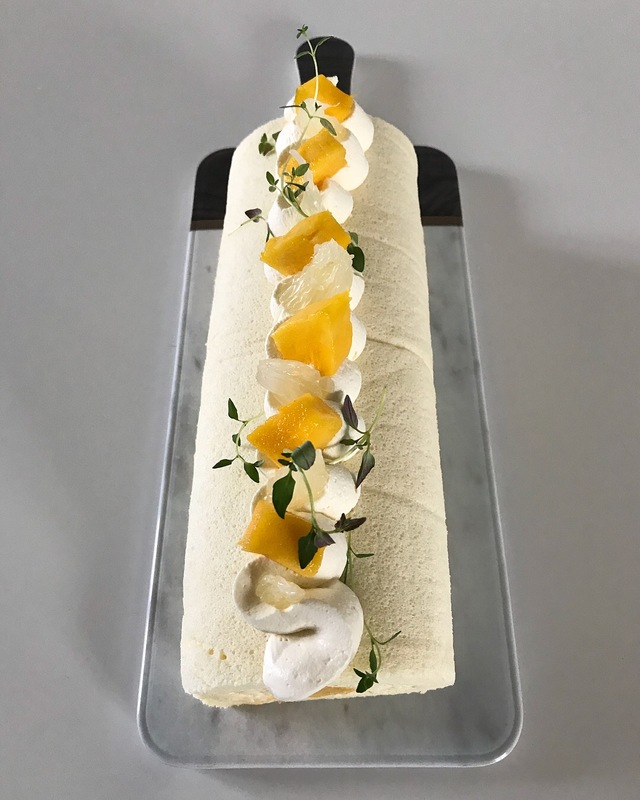 Ooh, the mango mousse cake looks SO refreshing-I just want to dive in with my spoon! Dark Chocolate Chiffon Cake. Never tried Chiffon but i hear it’s too die for and i love dark chocolate. It’s a really good combination… light chiffon and decadent chocolate. My favourite is the black sesame cake!! Best in the entire world! I discovered black sesame cake thanks to Jin. It’s such a great flavour. Pandan and Black sesame for me! They all look amazing, but I would choose the strawberry Swiss roll. Looks fab, love the shade of pink. The strawberry chiffon summer roll is delicious. Lovely for a summer afternoon tea. Dark chocolate chiffon cake! Irresistibly delicious!